Today I want to share with you the lovely experience we had in “Osho” restaurant and this quick recipe of Chiles Toreados (tossed peppers) I had in there with my delicious chilaquiles. Osho is a new restaurant that just opened in February, it is located in Teniente Azueta Boulevard, Playitas, Ensenada. Chef Juan Antonio Hussong is the master mind of this new concept. His food, as he described it, is packed with beautiful flavours, he cooks a little bit of everything, traditional Mexican recipes and international dishes. At the moment the restaurant is open for breakfast only, but soon he is planning to open the bar section and for dinner as well. I loved the list of different dishes they have on the menu, I chose some red chilaquiles with fried eggs and el ingles (the hubby) chose a Pacific breakfast which were eggs with salmon, cheese, grilled cactus and a slice of homemade brown bread. Chef Juan Antonio was very attentive and friendly. He talked to us for a while and told me about his project and he is proud that all the ingredients he uses are local and I definitely could tell because my chilaquiles were just perfect, crunchy and the sauce was amazing! The restaurant building belongs to the hotel Quintas Papagayo, which is a hotel that has been in his family for many years, he had to refurbish the building completely, but the finish is excellent, it feels very cosy, fresh and has a countryside touch. The prices are very reasonable and the service was perfect! I loved my breakfast very much, but I have to confess that I felt in love with the serrano peppers that they brought to our table as a side dish, so I asked Chef Juan Antonio if he could share his recipe with me and he was more than happy to do it! So thank you Chef for the recipe and the lovely breakfast, we will definitely be back before going back to London! Osho for me is my new discovery of this Mexican holiday and a must try place. Chiles toreados is a very popular recipe mainy for tacos, it is very common to find these chilies when you go to a taqueria. The taquero (a person that makes tacos) grilled the chilies and add soy sauce. They call them “toreados” because of the traditional way the chilies are done, they need to be put on a frying pan and toss them. 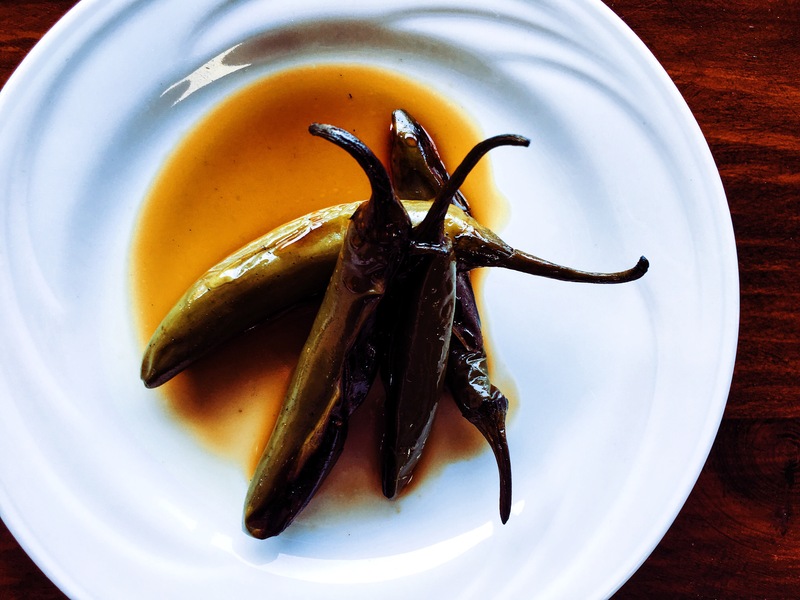 The recipe changes depending on each person, some people add onions as well, others add garlic and others use different chilies, but traditionaly the chilies that are used for this recipe are either serranos or jalapeños. Heat a frying pan. It has to be very hot. Then add the chilies and toss them around until they are chared. Place them in a bowl and add as much soy sauce as you want thrn add a tiny pinch of garlic powder. Leave them aside to marinate and serve them as a side to accompany any dish.